Today it’s getting more and more common to see high food prices. Having a good piece of steak is almost too good to be true in this economy. So, there are other less costly options. Some steaks, like flank steaks, don’t cost as much as other steaks and taste just as good. Flank steaks can fit into a budget and doesn’t have any bones in it. It holds favor well and is also known by the name London Broil. Here is how you can cook a great flank steak. Read on. Buy the flank steak that is clear and red. The outside should be bright red and the inside darker, in its natural state. The steak should ideally be firm and cold. The packaging should be intact. The meat can be stored for 3 or 4 days in the refrigerator. If frozen the meat will last about two weeks. If you need to store the meat longer, use other items like freezer bags, foil or freezer paper to protect the flank steak. There are different ways to cook the steak. Marinate the meat in an acid based marinade. Use approximately ¼ cup to ½ cup per 1 to 2 pounds of steak. Coat and submerge the entire meats. Cover and refrigerate for a minimum of three hours. Overnight would be best. Place the marinated flank steak on the broiling pan. It should be 2 or 3 inches away from the heat. Allow the oven door to remain open. Cook 6 to 7 minutes on both sides if you like a medium rare steak. Be careful about how long the steak is cooked. It’s easy to make it tough. If you want to grill the steak, put it on direct heat. Do not cover the steak. Grill for about 17 to 21 minutes. Turn the steak only once when grilling. You can prepare you steak with stuffing. To do this, lay the flank steak flat and spoon stuffing over it. Roll the steak and tie it with a 2 inch cotton string. Bake on a sheet in a 35o degree oven for 40 minutes. Most stir fry is prepared with flank steak. 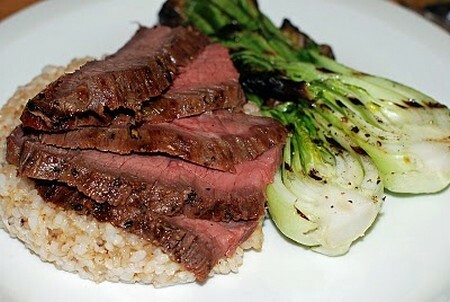 To prepare, purchase flank steak that is cut across the grains. Coat the steak with corn starch and cooking oil. Add salt and sugar along with soy sauce. The steak is added last after all the ingredients are cooked. This method requires that the wok is very hot. It should only take about 30 seconds for the flank steak to be cooked.